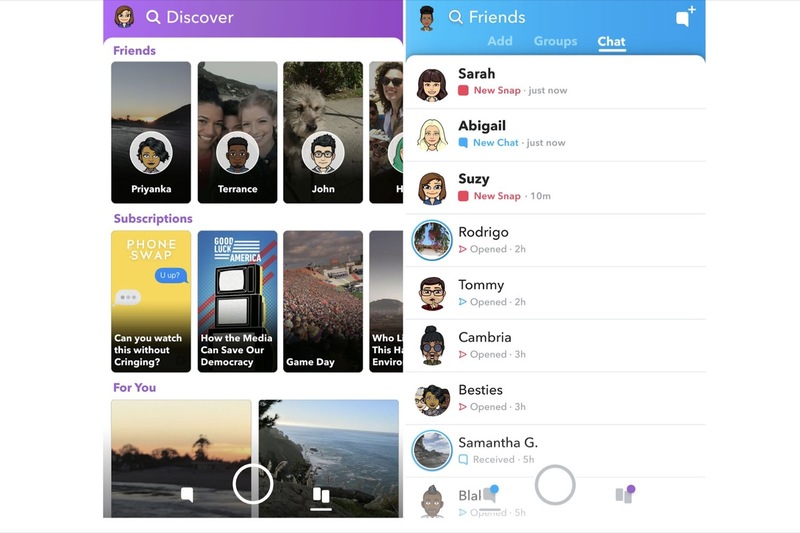 Snapchat has adjusted its iOS app interface to placate a large number of dedicated users who complained about the recent redesign, reports The Verge. Snap unveiled its radical redesign in November with the goal of creating a personalized user experience that's easier to navigate, especially for newcomers. But the change didn't go down well with many long-time users, so much so that 1.2 million of them signed a petition asking the company to walk back the UI changes. Snap initially responded to the outcry in February by acknowledging that "the new Snapchat has felt uncomfortable for many", but went no further than to reassure users that they would eventually adapt to the changes over time. However, it appears the company has now decided to roll back at least some of the adjustments it originally made as part of last year's redesign. For example, Snaps and Chats have gone back to appearing in chronological order, while Stories from friends have reverted to their original location at the right-hand side of the interface. Similarly, Snapchat now opens in camera mode, as it did prior to the redesign, and users can again swipe left to view the latest friend posts. Elsewhere, a separate subscriptions feed lets users search separately for stories by publishers and popular content creators. The changes come in an update to the iOS app that the company says is currently rolling out to users. Snap originally made the changes to appeal to a broader demographic and expand its user base, in the hope of fending off the threat of encroaching rivals like Facebook and Facebook-owned Instagram. However, the company's first quarter earnings suggest the strategy has so far failed to boost earnings, with Snap making less money per user despite having grown its global user base by around four million over the previous quarter. Now it’s even more f‘d up. I‘m mad. Can’t delete the app tho cause I have their glasses and can’t sync without the app. Oh cool you're the one who bought the Snapchat glasses? The crazy part... the CEO of Snap made $509 million last year. Can someone explain how a company operating at a loss managed to pay that? I’d be one furious stockholder. I have a feeling that Snapchat didn’t change this for the users, but for the advertisers. When the stories were on the right side, I would sometimes scroll down and click on the “news” (I’m assuming that’s a major source of their income). Ever since they pushed out the update where they put everything on the left side, I never swiped right and looked at the news. I would imagine that’s the same case for a lot of people, and Snapchat is losing a lot of revenue due to this. I somehow knew they were going to roll it back because of how pissed almost every Snapchat user was. We all know they didn’t make those changes “to appeal to a bigger demographic”. What a load. They made that change to put more advertising in our faces. They really shot themselves in the foot. Now people have gone to Instagram and even with Snapchat changing things back, people will be reluctant to leave Instagram. Oh come on!! I thought this will bring slow death to snap chat!! Is there a way, Instagram can die too? Two ridiculous apps that will bring down the next generation!